Ron Mayo of Flooring Systems Inc won the best commercial carpet installation from the 2014 FCI Installation Awards program. These awards were designed to showcase expert professionals in the installation community and are voted on by FCI readers. The award winning project was from the Good Samaritan Regional Health Center in Mount Vernon, IL. The project consisted of installing carpet tile, porcelain, ceramic and quarry tile, stone and sheet vinyl for the 142-bed, 500,000 sq ft facility. According to the award entry, Ron used Tec products "solely throughout the installation including the company’s vapor barrier, self-leveling underlayment, skim coat, crack isolation membrane, adhesives, mortar, grout and caulk. The installers had to prepare surfaces for both wet and dry environments - including patient showers. The LiquiDAM Penetrating Moisture Vapor Barrier was applied to the concrete substrate throughout the hospital." Furthermore, Ron explained that "smooth Start Self Leveling Underlayment, PerfectFinish Skim Coat and Fast-Set Deep Patch readied the substrate prior to the application of adhesives. In patient showers and restrooms, the installers performed flood testing of Tec HydraFlex Waterproofing Crack Isolation Membrane. Generally, the installers had to install a wide range of flooring types. A wide range of Tec adhesives – including Solid Vinyl Plank and Tile Adhesive, Clear Thin Spread Adhesive, Releasable Pressure Sensitive Adhesive and Premium Fast Grab Carpet Adhesive – were used to achieve long-lasting bonds with wood-looking sheet vinyl and carpet tile. 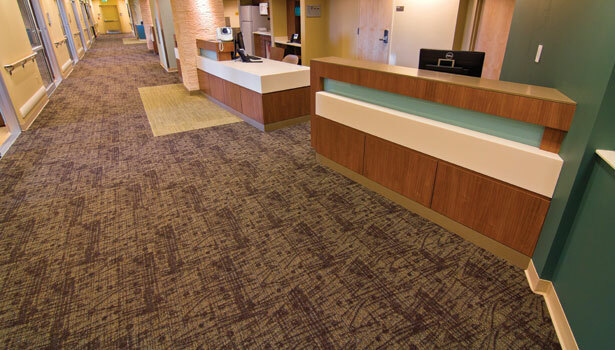 Carpet tile was used in the hospital’s corridors, offices and waiting areas, while sheet vinyl was installed in corridors and patient rooms."